In the past, Facebook Messenger was just a way to chat with friends or keep in touch with relatives. Now Facebook Messenger could be one of the most powerful tools online for brand presence and customer engagement. A Nielsen survey showed that messaging is the second-most popular form of communication for customers when interacting with brands. With consumers sending around 1 billion messages to businesses every month, you can’t afford to miss out on valuable opportunities to communicate and connect with your target audience. Let’s look at how Facebook Messenger for business evolved, and ways to take advantage of these features. Facebook Messenger has changed and let’s face it, the chat-centric feature is now a part of many brand’s advertising strategy. My how times have changed. But we’ve known for years that the best marketing ploys involve connecting with your audience and doing so where they live. While Facebook offers the opportunity to pay for display advertisements and banners to enhance your reach, mounting evidence suggests people are tired of seeing too many ads in their social feeds. If you’re concerned about over-saturating networks, you need to get attention elsewhere. Facebook Messenger also allows you to develop stronger and more personal connections with your customers. Since customer experience is one of the primary differentiators brands tap into, it makes sense to give your followers the interactions they seek. In the past, Facebook Messenger for business wasn’t seen as a viable source to engage customers. Brands saw more value in one-to-one interactions on networks like Twitter. And while that’s still a useful and critical tactic for your social media strategy, many simply didn’t know how to harness the power of Facebook Messenger. Facebook took note of this and began making changes. 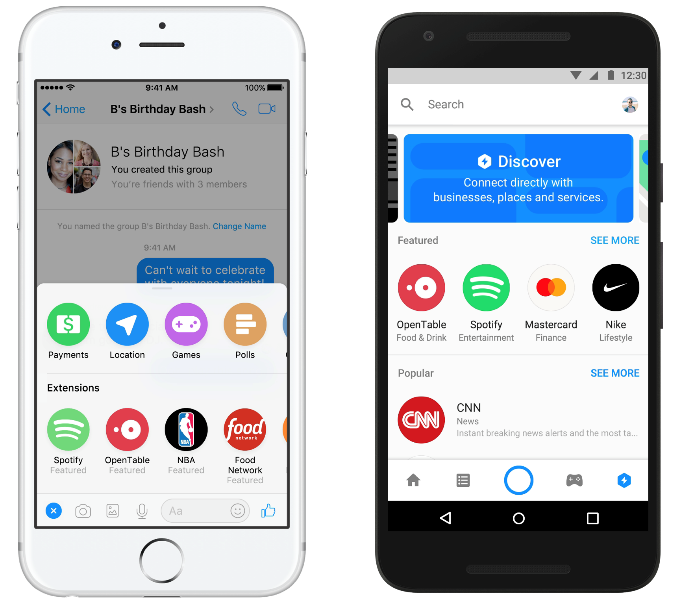 Now the Facebook Messenger 2.0 comes with a feature called Discover, which helps customers learn more about any business, start conversations or book an appointment. 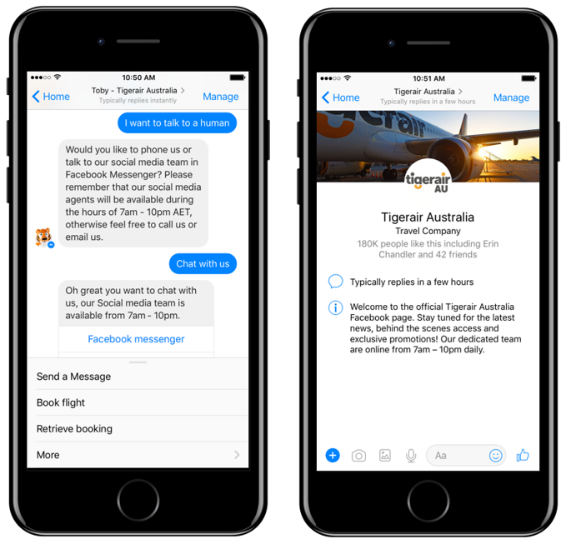 To take it even further, here at Sprout Social, we launched the new Facebook Messenger Chatbots, and with that a complete guide to chatbots. Our messenger bots help deliver personalized content to users while automating repetitive tasks. We’re not trying to take the human out of customer interactions. Instead, we’re being smarter about Facebook automation so brands scale and build unique interactions with their customers. Facebook Messenger Bots are certainly one of the most important features brands can use immediately to reduce tedious tasks. Don’t believe us? Sign up for a demo to see how we can help your business bloom. Today’s customers don’t enjoy using the phone for customer service. When you’re on the phone, it’s tough to multi-task, so you feel like you’re wasting important time. Waiting for an email can feel painfully slow, and online forms are too frustrating. That’s why Facebook has made it easier than ever for brands to engage with their customers through chatbots and chat extensions. In an environment where the number of social messages which require a brand response increased by 18% between 2015 and 2016, the ability to tap into AI assistance could transform your company. For instance, with Sprout Bot Builder technology, we found that most companies used their Twitter chatbots to automate tasks that would otherwise take up an agent’s valuable time, such as answering FAQs or completing orders. Facebook Messenger is now supporting the same kinds of use cases, improving productivity for brands on social channels. With the right technology, and the help of Facebook’s chatbot features like “Smart Replies” and “Auto Response”, companies could give their customers the simplified social customer service they’ve been searching for, without spending extra time and money on training countless new agents. Speaking of boosting customer satisfaction, if you want to delight your followers, then you need to be able to respond quickly to incoming queries. Again, chatbots help with automated responses, but staying organized can be the reason your communication management is successful. Using an all-in-one, single-stream solution to all your Facebook, Twitter, Instagram or LinkedIn channels can make the difference. This provides brands with a simple solution to centralize communication on every Facebook-owned property along with your other core social channels. Because everything is connected in the same place, you don’t have to worry about moving between services and accidentally allowing things to slip through the cracks. Ultimately, the outcome is faster response times and enhanced customer experiences. Working within a single inbox adds context to communications too. In a phone call, you have very little prior knowledge about a customer, but if you’re connecting through social media, you tap into a rich customer database. A couple of clicks is all it takes to help you give your clients a more personalized service. We’ve already touched on the power of chatbots in Facebook Messenger, but the social network has also stepped further into artificial intelligence (AI) solutions. 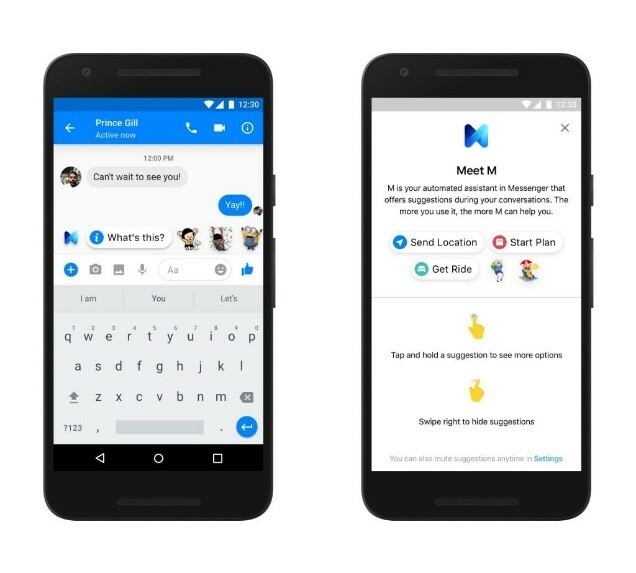 In fact, Facebook recently announced its own AI personal assistant called M. This feature helps suggest certain conversations with Facebook Messenger, remind you about important birthdays or even recommend getting an Uber or Lyft if you’re leaving from a certain location. Some businesses have already begun to build their brands through integration with M. For instance, if you type “recipe” into messenger, you’ll get a collection of recipes straight from Food Network to scroll through at the bottom of your screen. Similar partnerships are expected to start rolling out throughout 2018. This is the fundamental AI layer that Facebook has begun to bring to its business services. Though the AI brain is relatively limited in the kind of suggestions it can offer right now, it should eventually become a 100% AI-powered system. If Facebook’s M or chatbots prove anything, it’s that providing brands with better ways to connect to customers is high priority. There are roughly 100,000 chatbots in use on Facebook Messenger and that number is only growing. In the early days, bots on Facebook were plagued with problems and many still lack the ability to place orders or resolve customer issues. That’s why it’s important to use the right bot-building platform if you want to give your customers an experience they can trust. 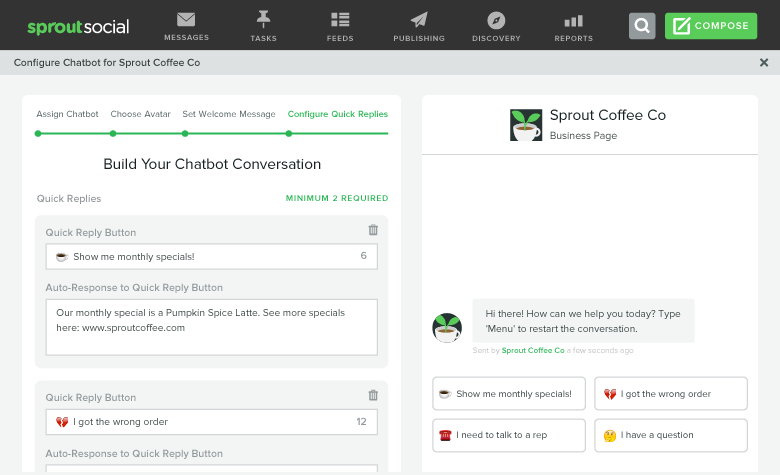 Even if you use a system like Sprout to develop your automation strategy, it’s worth remembering that your customers may still want to escalate their conversations. Being present is still critical to any social strategy, but it never hurts to get help on the more tedious tasks. Facebook Messenger recently rolled out traditional marketing solutions for customers. In July 2017, the brand introduced image-based ads for messenger, which allow brands to send coupons, banner ads and more in an instant. The messenger upgrades also deliver opportunities to create new revenue for your brand. 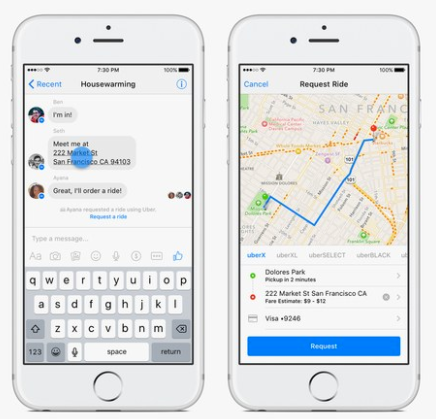 For instance, Uber, one of the early adopters of Facebook Messenger, created a direct channel for their customers to hail rides through the app. Similarly, KLM (a Dutch airline) uses Facebook Messenger to provide clients with important tasks. KLM offered features like booking confirmations, travel updates and even boarding passes. This means every customer gets an enhanced online experience. In 2018, Facebook Messenger could be the new way to reach people and encourage sales. Think of doing this without having to rely entirely on paid advertising. With the help of chatbots, you make the experiences available even more efficient. As an application that reaches a billion people , Facebook Messenger has a lot to offer growing companies. Not only can you use this system to generate more awareness, but you can deliver stronger customer experiences. For your followers, this only enhances brand loyalty. While social media is the preferred platform for customer service, it’s only recently companies tapped into the right resources. This helps properly serve audiences without having to break the bank. Explore how Facebook’s updates and Sprout’s Bot Builder tools can help your business succeed.